Kate wanted to read the Facebook status again, the one she had memorized in the seven hours on the road since she threw a change of clothes and a toothbrush into her backpack and jumped into Jase’s car. That’s where her phone was, propped up in the cup holder, attached to its charger like an umbilical cord while she and Jase sat in a Waffle House, unable to reach it, unable to read those words for the hundredth time that night. While Kate thought of Facebook, Jase’s mind lay elsewhere. He searched his memories, trying to find the path that had led him here. When Jase and Kate hit a storm in the middle of the night, they sought asylum and coffee at a random exit in North Carolina, finding a boarded-up gas station and the Waffle House. Now, looking through the slightly fogged window, they couldn’t make out the letters on the big yellow sign for the rain, which hurled itself against the pavement. Neither Jase nor Kate had been in a Waffle House before and were mildly surprised by its contents: the blocky electronic jukebox, the batter oozing down the waffle irons, the dingy grey floor angled neatly into a drain so it could be hosed instead of mopped. It was empty, save for a small family sitting at the counter. After Jase and Kate settled at a booth by the far window, a weary waitress placed silverware in front of them and complained about working long hours. When they put their order in—two coffees and two hash browns: one covered and one smothered and capped—she informed them that the cook was out taking a smoke and she wasn’t sure when he’d be back. Neither one had wallets cushioned enough to pay for a hotel room while they waited for word of Ben’s health. One semester deep into their freshman year of college, a road trip like this—from their Philadelphia suburb all the way to Ben’s college town in Florida—was enough strain. Kate wished, like she often did, that Ben hadn’t moved away for school. Or, at least, that she and Jase had gone with him. They were supposed to, ever since their trip to Orlando in their junior year of high school, a trip for band that had required months of fundraising. That was the trip, Jase often recalled with glee, when Kate’s breakfast made a guest appearance as she puked it up on Space Mountain. She had been queasy for the rest of the day, and Ben had bypassed the rides to walk around with her. He had convinced Jase to begrudgingly do the same. As they strolled through Magic Kingdom, dazzled by the wintertime warmth and by the glamor of Disney World, they made a pact to go to college in paradise. Of the three, Ben was the only one to return to the state. “So they might not let us in his room. What are we supposed to do, turn around?” Jase said. Jase’s face crumpled into a frown, but he said nothing. He thought back to the Facebook status, too, the one that had spurred him to action. His mother never used—and she would never use— the word overdose. They knew that she wouldn’t dare say the phrase “suicide attempt” either, but Kate and Jase were sure that’s what it was. A rushed exchange over Facebook confirmed it. Yes, he was still alive, yes, Ben had finished finals, no, his roommate found him unconscious in their dorm room, yes, the family found a last minute flight out of Baltimore and would arrive in Florida around midnight, no, she can’t talk anymore, she has to go, goodbye. Kate’s fingers itched for her phone to check one more time for any news at all, good or bad. Jase fidgeted, his eyes sweeping the restaurant. Kate said nothing, staring at Jase’s fingers as they plucked packets of sweetener from their plastic box, reorganizing them in a pink-yellow-pink-yellow pattern. “Oh. Yeah, irresponsible,” Kate said, tilting her head to look across the restaurant. Her eyes took a bleary moment to focus on the family of three that sat at the counter. The baby, just old enough to sit up by itself, wore a onesie the exact color of the oversized pastel yellow t-shirt Kate wore, one that bore the name of her college. The baby’s mother wore fleece pajama bottoms, their pattern something cartoonish but too matted to decipher, half-tucked into a pair of cowboy boots. The mother’s camisole didn’t quite cover her back, revealing the clasp of a neon purple bra. She obscured the man who sat next to her, who Kate assumed was the baby’s father, but Kate could see a camo ball cap and half of a dark-haired head bobbing along to a voice that sounded like chewing tobacco. Jase saw that the baby had turned to stare at him, and for a fleeting moment he wanted to lock eyes and see who would blink first. He shook the idea from his head. He noticed that both the parents and the waitress all looked to be his own age, only about nineteen or twenty. He suddenly felt overdressed in his polo and cargo shorts. “They might ask the same thing about you,” Kate replied. If the waitress had sauntered back to their table and asked in her sweet tea drawl what he, a Yankee and future yuppie, was doing here, Jase wouldn’t have had a response. He didn’t know why he was sitting in the booth of a Waffle House in The Middle of Nowhere, North Carolina on his third day of winter break. He didn’t know what processes of the brain had caused him to jump into his car five minutes after hearing about Ben, pick Kate up by the curb of her parents’ house, and head south. His circuits had been fried with adrenaline and fear. While he drove, focusing on the unfamiliar interstate before him, he couldn’t stop thinking about how he hadn’t visited Ben sooner. They had always agreed that they could either go to a mediocre school nearby, or they could go to a mediocre school in the Sunshine State, and Ben was the only one with the courage to follow through. Jase had felt his throat tighten; in the three months of Ben’s first semester alone, Jase had never visited him. Why, he thought, did it take a handful of sleeping pills, thrown back after a Statistics I final, to bring him to see one of his best friends? Jase tried to picture visiting Ben in the hospital, but all he could imagine was anger. He imagined that if by some miracle they were let up to the hospital room, Ben’s mother would take one look at the pair, and she would scream. As he thought about it, he remembered that she had intense, frightening eyes, eyes that would fix on Ben like an interrogation lamp. How dare they show up now, now that it was too late? They could have helped Ben before he tore up his insides. She would push them out the door and people would stop in the hallways to stare as she admonished them for having the guts to show up. Jase would sob his sorriness, but she wouldn’t listen to him. Even worse, he imagined, Ben would be angry. He would be conscious, lying in his hospital bed and surrounded by gently beeping monitors. Ben would take one look at Jase and begin screaming his lungs raw about his massive betrayal. Jase’s yelps of apology would be drowned out by the anger and the panicked beeping of the machines. He would flee from the hospital, and he would end up giving Kate his keys, too distraught to drive. Jase didn’t say any of this to Kate, of course. They didn’t speak much on the ride down. Instead, in the passenger seat, Kate blasted music from the speakers. She wasn’t sure what to play. At first, she played music from their middle school years—Disney channel stars and gimmicky pop—but singalong songs felt cheap. She felt the pressure of choosing appropriate music, and she wished Jase would let her drive. After Ben had tapped the bumper of Jase’s elderly Volkswagen against a curb in their senior year of high school, Jase was more cautious with his keys. He swore you could see a dent on the front fender, but Kate never could, and as they drove, this struck her as petty. They ended up listening in silence to the discography of a woman who crooned quiet songs, the albums blurring together, Jase and Kate sometimes nodding as if actually listening to the words. Jase yearned for the jukebox that sat behind the family at the counter. He had never played anything from a jukebox, but he still felt a tug of nostalgia, as if tapping the touchscreen would bring him back to a nonexistent ‘80s childhood. Jase and Kate watched the baby pound its meaty fists on the counter before Kate tried to resurrect the conversation. “She could at least bring out the coffee,” was Kate’s curt response. And with that, they fell into a lull, absentmindedly watching the baby as it stared up at the waitress with eyes as glazed as their own. They sat like this for several minutes, their stasis only broken by the arrival of another customer. He wore a scowl in his eyes, perhaps because water dripped from his hair into his face. When he took off his blue slicker that sweated raindrops, they saw a handgun on his hip in a tidy, black holster. Nobody else seemed to notice the weapon, and Kate and Jase exchanged concerned glances. The waitress called out that she would be with him in just a minute and went back to her conversation—something about a mutual friend’s problems with a promiscuous fiancée. The man sat down on the opposite side of the Waffle House, ignoring the sign that politely requested that booths be reserved for two or more customers. Jase wondered how often Waffle Houses were robbed, but then he figured that if one was to commit armed robbery, one would probably not sit down first. The man studied the menu. “Waiting for his date,” Jase replied. Kate snorted but said nothing, and the two resumed their silence for a few moments as their minds slid back to Ben. Kate suggested that going forward, they should talk to Ben every day, at least over text. Jase agreed, but he didn’t look her in the eye. “I just don’t understand what we did wrong,” he said. The two resumed their vigil over the Waffle House. The man with the gun pulled out a cell phone and scrolled, his back hunched over his table. The baby swayed, staring into the distance. It rained on. After a few minutes, the man with the gun slid out of his booth and headed to the jukebox, smoothing a one dollar bill in his hands as he walked. Slightly jealous, Jase motioned for Kate to watch the man as he stared at the screen, and Jase wondered aloud what song he would choose. “I hope it’s Britney Spears,” Kate said. When the first chords rang through the restaurant, they both recognized it as AC/DC, but when the chorus kicked in they realized that the man with the gun had chosen “Shoot to Thrill.” They exchanged panicked glances, but the others didn’t seem to notice or care about the man with the gun, even if Jase thought he had a shifty look in his eye. Kate and Jase supposed that this was the kind of thing that just happens in the south, or at least in Middle of Nowhere, North Carolina. After their brief burst of concern, they slipped into sleepy stasis again. The baby swayed, staring into the distance. It rained on. Kate couldn’t help but hope that after his ordeal at the hospital, Ben would take time off school so she could visit him at his house. She could help, and the idea of that made her swell with pride. If she were physically there, she could fight off the creeping sadness that swallowed him. Or perhaps she couldn’t stop him from being sad, but she could definitely stop him from acting on it. She imagined diving across Ben’s bedroom to slap away a blade or another handful of pills, and how the clatter to the floor would sound like victorious applause. He shook his head and fiddled with the sugar packets again. The two sat in silence. The rain continued to pound on the glass, demanding to be let in, and now thunder cracked like an echoing bullwhip across the sky. Kate snorted. She wondered what would happen after they finished their coffee and hash browns and piled back into the car. She imagined driving south, the rain letting up as they worked through the angry blots of orange and yellow on the weather radar. Dawn would blind her in the passenger seat a few hours before they arrived, and when they pulled into the hospital parking lot and opened the doors, fast food wrappers would cascade to the ground. They would walk bow-legged stiff to the front desk—do hospitals have a front desk?—and Kate imagined a grim woman in a starch-white uniform looking up from her computer to say that Ben couldn’t accept visitors and I’m sorry, but you have to go home. 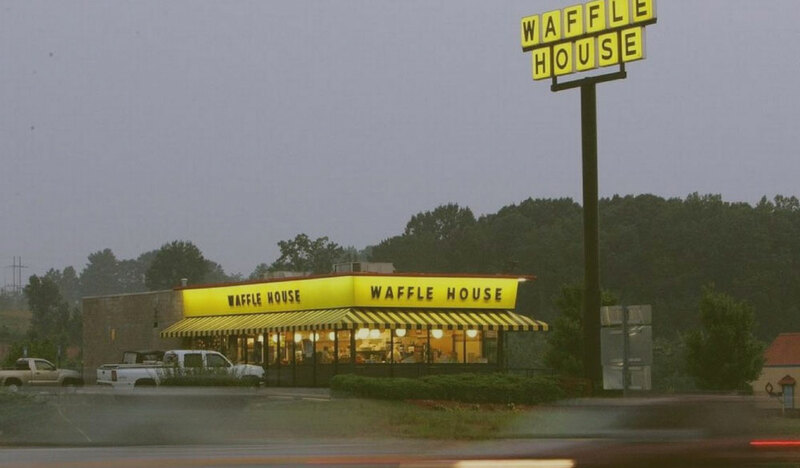 Maybe they would sit at another Waffle House and stare into their cups of coffee for an hour or so, dreading the twelve hours on the road back home. Maybe in that Waffle House, their waitress would move quickly, for it was only now, after serving the man with the gun, that she made her way to Jase and Kate’s booth with her pot of coffee. Somehow, the pleasantries of “Thank you” and “Could I get some cream, please?” brightened them, and they realized that they could speak to each other again. In the back, the cook returned from his break and the waitress began to argue with him, their words obscured by the sound of the rain hurling itself at the glass windows. As the sky rumbled, he returned to the kitchen, muttering to himself as he slammed a pile of hash browns down and scraped them back and forth on the grill. Before the smell of potato could hit their noses and give them hope for the meal ahead, a clap of thunder killed the lights and extinguished the jukebox. Someone shrieked, either the mother or the waitress, but the baby made no sound. Kate thought that this was a scheme by the man with the gun and that she would hear shots at any moment, but when her eyes adjusted she could see that his face, lit by the blue-white light of his cell phone, was just as alarmed as hers. The cook grumbled that he could never cook food by candlelight. Jase wondered how often the power failed in this little North Carolina town, if the waitress came prepared. He watched her set a series of tea lights on the counter after some blind searching and bartering for use of the cook’s lighter. The waitress smiled in the warm light. “Y’all are welcome to sit over here,” she called. The man with the gun moved over to sit next to the camo-capped father, but Kate and Jase stayed at their table. It felt odd to stare now, to gawk at the young couple and their baby who stared mesmerized at the candle flames. Kate busied herself with her coffee, thinking about how they were truly stuck now, with no way to pay their bill and no way to get their food. Jase thought about how uncomfortable it was to be in a Waffle House that couldn’t function as a Waffle House; they might as well be waiting out the storm in an out-of-order public bathroom. Both of them thought that at this moment, they could not speak, as if it would break a spell and the waitress and the family and the man with the gun would know that they had been telling stories about them, molding a fantasy, mocking their lives. To speak would be to be filled with enormous shame. When they told the story later, neither one of them was sure how long they sat there alone in the dark. It was long enough to finish their cups of coffee and long enough for the man with the gun to tell a dirty joke that made the others roar with laughter, Jase snort, and even Kate stifle a smile. Jase and Kate looked at each other, both of them daring the other to speak while too afraid to break the silence that hung in the darkened corner of the Waffle House. It was finally Jase who did, calling back that yes, they were doing just fine, not scared at all. The waitress had poured herself a cup of coffee and raised it welcomingly towards them. They looked at each other again, unsure if they should sit with the strangers who made them feel so guilty, but they couldn’t think of a reason to decline the invitation. By now, their eyes were adjusted to the tealights on the counter, but they still walked carefully over to the counter and sat down next to the baby. The father leaned forward and for the first time Jase and Kate saw his face, a kind face with big, brown eyes, and he introduced himself and his family—he was Tommy, this was Savannah, and the little one here is Cheyenne, and where are you two from? He continued the small talk for a while, they all did, but the others could sense that Kate and Jase were weary and didn’t press them to speak more. No longer did they live in their heads and wallow in their guilt, and when the lights flickered back on and “Shoot to Thrill” resumed, they cheered with everyone else. They stayed quietly at the counter as the cook fired up the grills again, and after they scarfed down their plates of hash browns and drank their last mugs of burnt coffee, they over-tipped the waitress and slipped out. Their eyes were drawn to the gun at the man’s hip, but they tried not to gawk. It still rained, but a quieter rain that didn’t hurt as it hit skin. Jase tossed Kate the keys, and after adjusting the seat and the radio dial, she backed out of the parking spot. The buzz of the radio made a different kind of silence, and they pulled on the highway. The pump of the windshield wipers smeared the green and white glow of the exit signs on the road south. Sarah Boudreau earned her BA in creative writing from Young Harris College. Her work can be found in Columbia Journal Online, Little Fiction, and Profane Journal. She grew up in Florida, and she likes to think that this makes her an authority on alligators.